View of the main temple vimana. The Subrahmanya shrine is an east-facing shrine that sits in the northwest corner of the Brihadisvara complex. It is dedicated to Subrahmanya (Murugan in Tamil), one of the sons of Śiva. The shrine was built during the political rule of the Nayakas, who ruled Tamil Nadu from the mid-fifteenth to the late seventeenth century after the Vijayanagaras. The patronage of this shrine is traditionally attributed to Sevvappa Nayaka (r. 1565-80), the first of the Thanjavur Nayaka rulers, as a way for him to “proclaim his independence from Vijayanagara.”  By the end of the seventeenth century, Nayaka rule was overthrown by the Marathas, who promptly seized Thanjavur as a cultural and political center. The Maratha kings were known for their generous patronage of literary and artistic endeavors in areas where they ruled. They also patronized many temples and in the nineteenth century the shrine was further elaborated with royal portraits and richly ornamented wall murals. From the inside of the shrine facing the image of Murugan (Subrahmanya) it is obvious that the hall (mandapa) facing to the east is a later addition. Now gated off, the murals of the mandapa depict images of many of the Maratha ruling line, a few female figures included. George Spencer’s work on patronage in eleventh-century south India can help to unpack ideas of incorporative aspects of kingship and the inclusion of these portrait-murals in the second mandapa of the Subrahmanya shrine. According to Spencer, incorporative kingship relies on the concept of altering or utilizing pre-existing edifices, institutions or frameworks to rule an area, as opposed to constructing new ways of enforcing laws and governing people. Thus, instead of constructing an entirely new shrine, the Marathas decided to add to the mandapa in order to augment and legitimize their rule, while also connecting that rule with the image and associated blessings of Murugan. In addition, “royal patronage produced political returns and served as an important instrument by which existing institutions could be adapted, if only in part, to serve royal purposes.”  Other images in the mandapa include a dancing girl and a soldier in British-inspired attire, at once connecting performance traditions with military power. Today access to view the murals in the extension is barred by metal grilles; however, there could be many, varying reasons for this. One reason could be due to the perceived negative sentiments towards the Marathas as not being native Tamil citizens, or their association with “northern” styles of ruling. When I approached the Subrahmanya shrine, the image of Murugan could be viewed easily, and the hall that extended behind the worshiper would have added to the experiential effect of the ritual had it not been gated off. In this way, the additions of Maratha art have been excised from the ritual life of Murugan and his devotees, despite the fact that the hall may have been utilized by worshippers or kings at an earlier time. In doing so, Serfoji II incorporated elements of his Maratha heritage into the religious landscape of Brihadisvara. As one circumambulates the temple, a noticeable feature of the colonnade is the sudden appearance of Serfoji’s lingas against a backdrop of faded paintings ornamented with graffiti: the names of lovers marked in ink or hastily written in pencil. In much the same way that the Subrahmanya shrine was associated with the Marathas, so too, are the lingas associated with the rule of Serfoji II. Why they are now devoid of ornamentation is hard to say; perhaps the main stone linga eclipses the worship of these lesser lingas or people associate them with the Marathas, a non-Tamil people. In any event, the history of how the lingas have moved through public space can help inform our interpretation of the religious heritage of the Brihadisvara temple, and overall enhance our understanding of their contemporary function within the complex. Lastly, the Archaeological Survey of India (ASI) signposts and informational plaques scattered throughout the temple complex are a point of interest. These different signs and sets of information make me question their present function at the site, not for their inaccuracy, but for their imposition of historical information in a religious space that is in use. This merits inspection for the simple reason that these histories may or may not align with many worshipper’s own experience at Brihadisvara. Furthermore, because the temple currently acts as a place of worship for those devoted to Śiva. the desire for a personal connection with the deity and the imperative by ASI to disseminate information into the global arena (via UNESCO’s endorsement) may become a source of tension between the management of the site and its visitors. Former superintending archaeologist of ASI, T. Satyamurthy, recently stated that “the Brihadisvara temple in Thanjavur…came under the protection of the ASI in the 1920s and no restrictions were put on worship and religious activities.”  It should be noted many conservation practices, like re-plastering or repairing parts of the temple, are not defined as restrictions put on worship defined by the Ancient Monuments and Archaeological Sites and Remains Act of 1958, which applied to all of India. This allows temples to be open and available to devotees even during reconstruction. 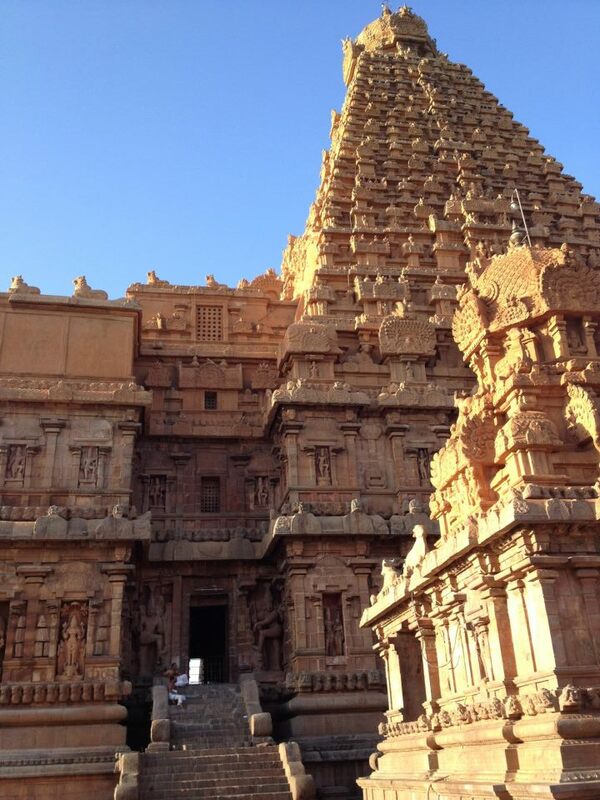 In a similar vein, as a UNESCO World Heritage Site, the Brihadisvara temple possesses the prestige and honor of presenting its specific cultural and religious history in a safely constructed space. In fact, an ASI-made pamphlet available for sale at the site states that the temple is “one of the ‘Great Living Chola Temples’ along with the two other Chola temples at Gangaikondacholapuram and Darasuram.” When I visited Brihadisvara on three separate occasions (once in the morning, twice in the afternoon) there was never a lack of people in attendance for worship and I remember standing on my toes to catch a glimpse of the large black stone linga in the main shrine. To me, it seemed that the posts made the temple appear more museum-like and less as a place of religious worship. It seems that they would almost present a counter-heritage, directly mirroring but not fully representing the wealth of experiences, spiritual, personal and historical, that Brihadisvara embodies in its specific religious rituals and customs. I also wonder how many devotees actually read these signposts; what is their reaction to the information presented on these signs? This being said, the suggestion here is that the issue of heritage-building is bound up with political events, religious doctrines and particular historical moments. Image of the closed second mandapa attached to the Subrahmanya Shrine. Priest is shown blowing conch before morning services. (Photograph: Hali Mason). Like Rajaraja Chola I and Serfoji II, UNESCO’s affiliation with Brihadisvara has begun to incorporate new elements of site governance that have never been imagined before; the import of new forms of global capital in the form of tourism and the interest in Brihadisvara as a fertile archaeological site. Do these factors really affect the quality of religious experiences for devout Hindus? These claims are speculative and more field research would be necessary to make any conclusion about the quality of religious experiences that people interact with at the temple; still, the presence of ASI signposts, just like the Maratha paintings and the lingas installed by Serfoji II, have changed the affective and experiential qualities of the temple complex. These physical changes in the material heritage of Brihadisvara aptly demonstrate how additions over time have, perhaps in small ways, helped to reformulate the meaning of its religious heritage. The events surrounding the continual building at the site can contribute to the current understanding of how religious heritage-building can choose what or what not to include in its design plans and local mythology. The additions to the temple and the discourses that emerge from their multivocal place histories help to illustrate not only the one religious heritage (in the singular) that I have been discussing, but the many heritages (in the plural) that are constructed and have been constructed throughout the lifespan of the Brihadisvara complex. MITCHELL WINTER is an undergraduate studying Religious Studies and Linguistics at the University of California, Davis. His interests include medieval south Indian poetry, language policy in colonial India and contemporary Hinduism in America. Since studying abroad in Tamil Nadu, his research has focused on the concept of heritage at religious sites in south India and how the construction of heritage often conflicts with the construction of individual devotees’ identities and self-formations. These individual identities ensconced within the larger scale of globalization and mass tourism is a subject that he hopes to elaborate on in the future.